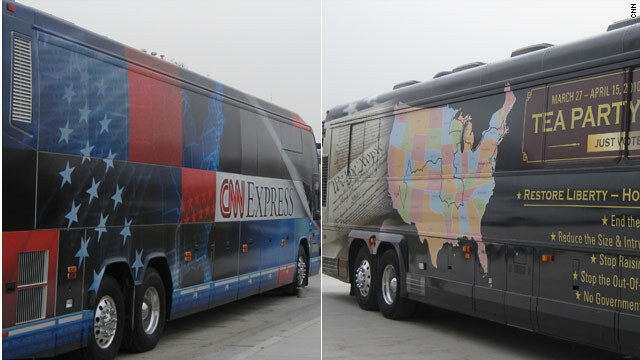 Washington (CNN) – CNN is teaming up with the Tea Party Express for a first-of-its-kind presidential primary debate, both organizations announced Friday. The Tea Party debate, featuring 2012 Republican presidential candidates, is scheduled for Labor Day week 2011. It will take place in Tampa, Florida – the site of the 2012 Republican National Convention. Since the spring of 2009, the Tea Party movement has been increasingly vocal in advocating for less government spending, lower taxes and shrinking the deficit. The Tea Party debate will place specific emphasis on those issues. Tea Party Express Chairman Amy Kremer talked to CNN about what activists hope to hear from Republican presidential candidates. "We want to hear what their ideas are – what their thoughts are – on turning this economy back around and getting us on a sound economic footing, paying down some of our deficit, getting a balanced budget, and reining in the spending," Kremer said. Kremer added, "We've proven ourselves in this last campaign, election cycle of 2010, we're the only Tea Party group that engaged in election activity. And we got involved because we simply believed that if we're going to affect change we're going to do it at the ballot box. And the tea party movement has proven how powerful it is." Sam Feist, CNN Political Director and Vice President of Washington-based programming said, "The Tea Party movement is a fascinating, diverse, grassroots force that already has drastically changed the country's political landscape." "Undecided voters turn to CNN to educate themselves during election cycles, so it is a natural fit for CNN to provide a platform for the diverse perspectives within the Republican Party, including those of the Tea Party," Feist added. The announcement of a CNN-Tea Party Express debate comes three days after CNN announced it is joining with WMUR-TV and the New Hampshire Union Leader to produce the first 2012 Republican Presidential Primary debate in the "First in the Nation" primary state of New Hampshire. That debate is scheduled to take place on June 7, 2011. I’d be interested to see if any actual ideas arise out of these ‘debates’ or are simply a bunch of angry while people going to show up for some free hotdogs and cross burnin’ firewood? Sounds more like a Palin Long Knives Rally. Despicable. Just another reason to keep me away from CNN (I don't go near FOX.) MSNBC all the way from here on out. except for Lemon and Anderson. I like them. CNN you have got to be kidding. Partner up with the tea party???? OMG LOL FIRE EVERYBODY IN YOUR MARKETING AND RATINGS DEPARTMENT BEFORE IT,S TO LATE!!!!!!!!!!!!!! By the way you have one less viewer! I’m not an angry Caucasian. I don’t believe that all brown people are Muslims and that all Muslims are Terrorists. I graduated from the 3rd grade. I’m not a witch and I know what magazines I read. Can I get tickets to the Tea Toilet debates? What? No? I'm not allowed to be there? Pssst.....The GOP cares nothing for poor Whites. Fox light. Armatures trying to be baggers. You can never match the hate and ignorance, just the stupidity. Yes, CNN really does need to let some discent in the door. or go the way of the dinasaurs. Your choice. CNN is showing business courage and truly embracing intellectual diversity – bravo! When are you going to stop calling this tea party? TPE is NOT TEA PARTY and is not recognized as such!!!!!! So much for being the "most trusted" name in news" . From now on I have to question anything i hear on CNN same as I would Fox. And lets not Not forget the TP racist agenda... I guess CNN is ok with that? WTF! Just follow the money...CNN is no longer a news outlet anymore than Fox "News" is. Face it, the Tea Party is just the illegitimate cousin of the GOP. Better read the posts above, CNN, or you will be left with only the right wingers–and as far as I can see, they are not interested in the real world–only the world they "believe" in...the one w/o science, technology, black people, muslims or anyone that doesn't agree with giving the wealthy everything they demand!! I certainly won't be watching CNN much anymore after reading this! This is wonderful news. CNN is helping a grassroots movement reach a wider audience. Judging by the ignorant remarks here, people should watch the debate before whining. Hay Fair is Fair. Its honest not honesst. You talk about a less inteligant Washington. It seems like your education level is that of a 5th graders. How about you get a college degree and then you can talk politics you jack wagon. Is this a Republican Debate or a Tea Party Debate??? I thought the Tea Party was looking for the Best Candidates, so why retrict yourself to Republicans only? What about Libetarians, or Conservative Party members, or even "No Party Affliates"?? ?.........Sounds Hypocritical, and just like RHINO Club-House Politics. You have a reputation for being fair in your reporting. You are really willing to risk that? As a news organization, you should refrain from sponsoring anything political! You are aiding and abetting those who spread misinformation on climate change when we might still have time to make some changes? Changes that the Tea party will campaign against, of course. As LB in FL said, Is Glen Beck next?